Mini paper umbrellas usually garnish your frozen concoctions - but they're also great for decorating with during the holidays. Stick dozens of colorful mini paper umbrellas into foam trees and wreaths for a fun and playful decorative touch. Swap out a traditional fir for a palm tree - string lights and hang ornaments from the leaves and place presents below for a holiday focal point. Arrange bright pink flamingoes around your yard, and then give them all festive Santa hats to show their spirit. 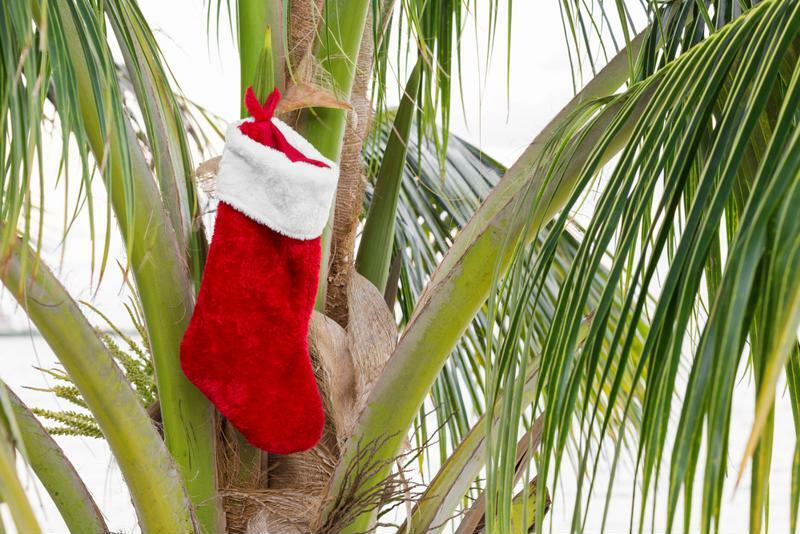 You can also give your other outdoor holiday decorations an island makeover - place a surfboard next to Santa and provide your light-up reindeer with some shade with beach umbrellas. Embrace the good vibes and welcome all who celebrate the holidays in your home by using flower leis instead of typical tinsel or popcorn garlands to decorate your tree. It's bright, colorful and just the thing for Christmas cheer. Deck the halls holiday-style this season. Display holiday bouquets in pineapple vases for an unexpected touch of paradise in your home. Simply slice the top off a pineapple and hollow out the insides. Add water and your flowers and voila - you have paradise-perfect centerpieces. Arrange bright, sparkly ornaments in shades of blue or pink with white seashells, starfish and other jewels of the sea. Place on your coffee table or use as decorative accents throughout your home. Imitate the magic of the first snowfall - without the chill - by adding a soft touch of shimmer to plastic versions of island staples like pineapples, mangoes, oranges and grapefruits. All you have to do is brush the top edges of the fruit with glue, then sprinkle with white or silver glitter. With some flip flops and string lights, you can create a quirky holiday tree. All you have to do is glue flip flops on top of each other, heel to toe, making the circular rows smaller and smaller as you get to the top, to form a cone shape. String lights around the sandals and you've got yourself some beach-ready holiday decor. Pinecones are a standard in a lot of seasonal decor - but did you know you can turn them into pineapples, too? All you have to do is paint the top quarter of the pinecone green and the rest of it yellow for instant mini-pineapples. Hang them from a tree, line them up on your mantel or scatter them on the dining table for a special dose of holiday decor. Seashells collected from your island getaways - or simply bought from the craft store - make wonderful holiday ornaments that add a tropical touch to your Christmas tree. Sand dollars and starfish are great picks - just coat them in glue, dip in glitter then either carefully drill a hole or securely adhere twine to the backs to turn them into ornaments. Hang ornaments, candy canes and artificial snow above your Margaritaville® Frozen Concoction Maker® to make a tiki bar that the North Pole would approve of.